The trend these days is to lose weight fast, a drastic action that brings the numbers down and let you start fresh, but we all know that you need to keep working out and keeping an eye on what you eat if you want to maintain what you have earned during your diet. The elliptical trainer is an exercise equipment that is an developed and upgraded kind of gym machine, it is built with the purpose to stimulate the muscles involved in aerobic exercise like running or walking but is planned in such a way that it eliminates the pressure usually placed on different joints in the body so that only the muscles are working and the pressure is not involved, this eliminates the risk of damage to the joints or injuries as a result of this activity. The huge benefits for the elliptical trainer user is that this machine is perfect for cardiovascular exercise and will not only help workout with a significant decrease of injury risk but also help to focus on the part you are interested in developing. The elliptical trainer is designed to develop the upper and lower body of the person using it, by using a special movable upper body trainer installed. 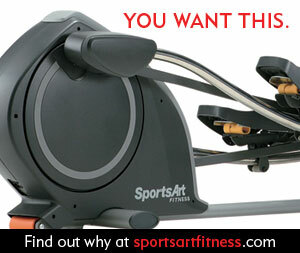 Most of the elliptical trainers on the market are planned to increase heart rate more than they are directed at developing muscle mass and power, much like the treadmill these machines have been found to have superior ability in increasing the users fitness and are also very effective in calorie expenditure, which means that the elliptical trainer is one of the most practical machines you can use if you want to loss weight and workout as you do it. The uniqueness of the elliptical trainer is that it is almost without risk of any orthopedic injury, and you avoid the risks involved in pressure on any parts of your body. The market has many different models of the elliptical trainer and it is very important to decide on what features you need before you even start shopping, there is also a wide range of prices for the elliptical trainer, but we can confidently say that overall this is not a cheap machine to buy. Some elliptical trainers have an electric option to them, adding a lot of more options that you may want to use, if you plan to use the trainer a lot you may want to consider purchasing one that has some advanced features like setup programs and work different groups of muscles, as well as monitor your advancement over time. If you are interested in just getting some kind of workout machine for your home you probably need a less sophisticated machine, but it is a shame to buy something you are going to use on a daily basis only to discover that other models have features that you could have benefited from with a moderate addition to what you spent, and this is the prime reason you should research this market before buying a machine. So do your homework, decide on what features are important to you, make sure your purchase is covered, and enjoy your elliptical trainer.